F21 is the first time attendance and access control terminal applying the most advanced SilkID technology. It not only possesses outstandingly high identification rate towards dry, wet and rough finger, but also provides the utmost security by its live finger detecting capability. As well as photo taking function which enables attendance photo and Photo ID (optional). 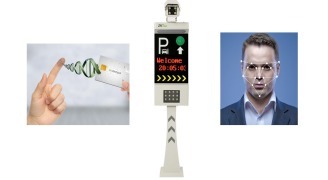 ZKTeco, global leader in biometric solutions, is this year having its global launch of its new solution Hi-FACE at IFSEC 2018. The ZKTeco SBTL5022 single lane swing barrier turnstile is an elegant high-performance entrance control system designed for high-traffic volume. ProCapture-WP is an access control terminal applying the most advanced BioID fingerprint sensor. Its outstanding performance provides a high identification rate towards dry, wet and rough fingers . HB510 is a newly launched Android 7.0 system based on the 5-inch handheld multi-functional biometric intelligent verification terminal. The product has fingerprint recognition as optional. It can be used in various industries according to different needs. With Push SDK communication protocol. SilkBio-101TC - Fingerprint reader, face recognition and RFID card functions. SilkBio-101TC is the first ever Time & Attendance and Access Control Terminal to be associated with SilkID fingerprint reader, face recognition and RFID card functions. inBIO a new concept access controller based on biometric identification aims to improve the security of users’ life and information. PFace202 is a multi-biometric time & attendance and access control terminal that supports up to 600 palm templates, 1,200 face templates, 2,000 fingerprint templates and 10,000 cards (optional). The DF-V1/DF-H1 is a Standalone Keypad single-door controller with metal case. It’s rugged IP65 rated Waterproof structure offers extra durability and makes it perfect for outdoor installation. FR1500 is a flush-mounted fingerprint reader with RS485 communication interface works with biometric access controllers and fingerprint standalone access control. FR1500-WP is a waterproof flush-mounted fingerprint reader with RS485 communication interface works with biometric access controllers and fingerprint standalone access control. The ProID family of card readers is designed to provide different options for customers. Which can support 125KHz EM, 13.56MHz MIFARE/DESFire/FeliCa/Legic. SF420 is an IP based fingerprint terminal for access control and time attendance management. Biometric technology is the perfect solution to control the access of users to physical locations such as buildings, offices, datacenters or restricted security areas in general. ZKTeco presents its latest HHRR Management Solution based on ZKTeco's Data Collection System integrated with SAP. The core of the system is ZKProto, a reliable, fast, modern, secure and flexible communication protocol based on the concepts of middleware and RPC (Remote Procedure Call). Saves money. No licenses to purchase. We can off er you a wide variety of turnstiles and fl ap barriers for different applications that are easy to install, operate, maintain and can also be easily integrated with third party solutions. Knowing that no two projects are the same, ZKTeco wants to ensure to meet requirements through a perfect solution tailoring any needs, and are suitable for all kinds of materials such as aluminum, wood, metal or glass. ZKTeco has developed the first multimodal device capable of capturing and processing finger vein and fingerprint biometric data at the same time. Ergonomic, intuitive and highly secured, FV350 leads us to a new era for biometric application to security. Biopad is ZKTeco’s new multi-functional data collection terminal, with Android 4.1 platform, integrated f ngerprint sensor or RFID module. 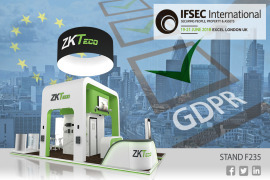 ZKTeco is once again getting revved up for another big show at IFSEC 2018, our 7th time exhibiting! 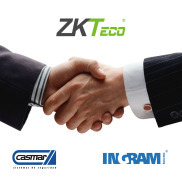 ZKTeco Europe has formed a distribution agreement with Ingram Micro andCasmar to provide ZKTeco biometrics premium line for access control and workforce management to the Spanish market. 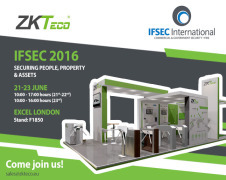 ZKTeco sincerely invites you to visit our booth at IFSEC 2016, where we will be attending at Stand F1850 officially launching our latest ZKTeco product range. ZKTECO 2017 Entrance Control Catalogue. Offering a wide variety of turnstiles and flap barriers for different applications that are easy to install, operate, maintain and can also be easily integrated with third party solutions. ZKTeco 2017 Time Management Catalogue - advanced fingerprint, facial and fingervein biometric technologies integrated into innovative and versatile terminals. Including server and web based software and all in one plug&play solutions. ZKTeco Europe 2017 Access Control Catalogue, including IP-based standalone access control terminals, networked biometric access control panels, IP65 outdoor readers, with all necessary integration tools, SDK’s and technical support to provide our business partners with complete solutions.